I’ll never complain about the heat again! This is what Bobby says now that the weather is cold again. And it will get colder before March. But at least it isn’t as cold in Memphis as it was for the runners in the Antarctic Ice Marathon a few days ago. 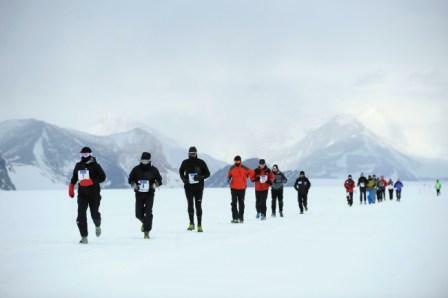 This race is run during the height of Antarctica’s “summer”. 37 participants ran over ice and snow. The wind chill is -20 Celsius (-4 Fahrenheit!). The altitude is 3,000 feet, so not quite a mile high like the Denver Marathon (5,280 feet). Winds blow at 10-25 knots (12 – 28 miles per hour). Don’t expect a PR here. The course record is 4:20:31. Still faster than I could probably ever run and they are doing it in -4 degree winds. Ask Beth how many times I've said this about whatever season is opposite from the present one! This is the first winter I've really run a lot outside, and I think I really like it…well, so far. I never really warmed up on Monday night's run so if it gets much colder I won't like it! Next Next post: I’ll never complain about the COLD again!